Join the Women's Business Center of California and The Daily Transcript at the Women's Business to Business Expo, Tuesday, Nov. 9, from 8 a.m. to 1 p.m. The event, which will be held at the Spectrum Academic Center, 9388 Lightwave Ave., will feature more than 60 exhibitors, an opportunity to network with other women business owners and a keynote speech from George Chamberlin, Daily Transcript financial correspondent. Admission is $10; call Elaine Bradbury for more information, (619) 563-7118. The National Association of Women Business Owners (NAWBO) is committed to supporting and representing the interests of women entrepreneurs in all industries. The following is a calendar of WBCC seminars, certification programs, expos and other special programs and events. To RSVP for any of the events, call (619) 563-7118. To celebrate the successful completion of its first year, the Women's Business Center of California (WBCC) is holding its first Women's Business to Business Expo, Tuesday, Nov. 9 at the National University Spectrum Academic Center in Kearny Mesa. The face of the American small business community is changing. A recent study by the National Association for the Self-Employed shows that startups of women-owned businesses outnumbered new men-owned businesses by nearly a 2-1 ratio in 2003. That trend is evident in San Diego County, too. 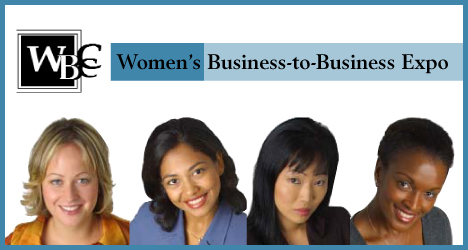 Welcome to the Women's Business Center of California's first ever Business-to-Business Expo! Throughout the year we have strived to provide workshops and seminars to help you grow your business quality education. Even though these seminars are a networking environment, our "B to B" is the ultimate networking tool to grow your business. The Women's Business Center of California Business to Business Expo is all about women-owned businesses showcasing their products and services to other women and the business community at large. The event will be held Thursday, Oct. 20, from 9 a.m. to 1 p.m. at National University, 9388 Lightwave Ave.